The service yard – also know as a service balcony, laundry or utility room – is often an afterthought in home designs, despite how many needs it can serve. 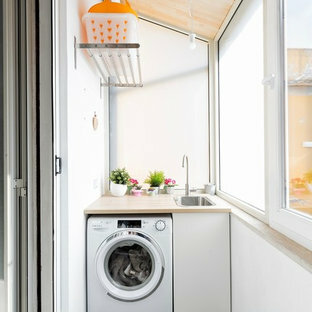 Complete with a washing machine, dryer, ironing board and appropriate racks and shelving, your service yard can simplify your household chores, store dirty washing, drying clothes and cleaning products, and be a spot to do your ironing and folding. In HDB flats, this is where the rubbish chute is as well. 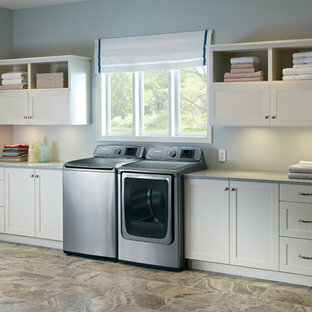 If your service yard or laundry is not working to its full potential, a renovation could be a wise investment. Before you undergo any changes, browse the photos on Houzz for efficient service yard ideas, from layouts and storage to appliances. Since the service yard handles so many functions, you'll want to think about common issues that can arise. 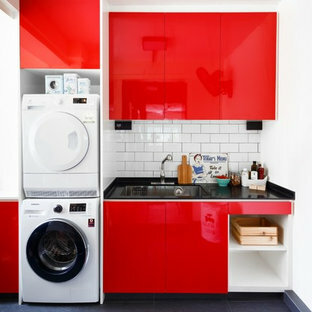 Firstly, consider your space limitations - the actual working space that you have after factoring in location of pipes, where your washing machine's tap is located, as well as convenient access to your clothes rack space. Next, consider privacy and safety concerns. If you live in an apartment where your service yard opens up to your neighbours, consider installing window grilles to prevent possibilities of unauthorised access to your home via this space. If you have young children, window grilles will also rein in their curiosity and keep them safe! To keep out wind and rain, consider waterproof blinds as well. 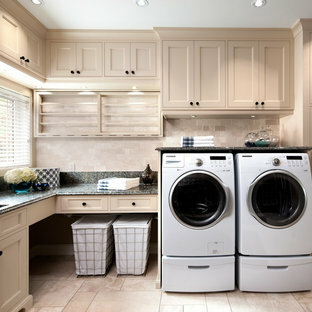 Layout considerations will probably be the most important: think about where your washing machine, storage (cleaning products, laundry accessories) washing sink, and drying rack should go. A professional will also be able to highlight issues unique to your service yard that you may not have thought of. 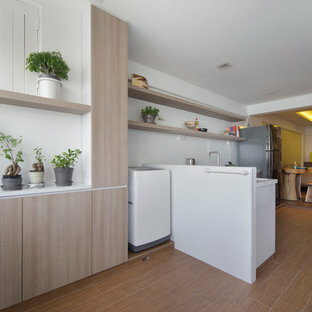 Our increasingly small spaced living lifestyle means kitchen spaces come connected with the service yard. You might want to look at kitchen photos on Houzz to see how these two spaces relate to each other, and also a different angled view of service yards from the kitchen. How do I add storage to my service yard? 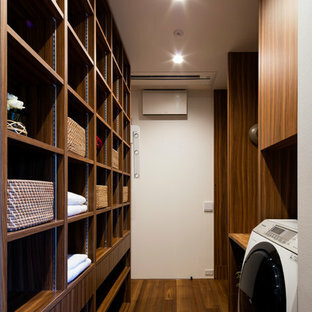 A combination of storage solutions is key to running an efficient laundry. 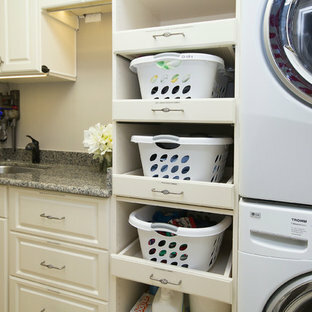 Include shelving and racks above or beside the washing machine to store washing detergent, softener and other cleaning products; and a laundry basket for dirty clothes. Consider a custom-built cupboard for an ironing board, so it can easily fold out when you need it, or mount the ironing board directly to the wall or on the back of a door. A retractable clothesline is a handy addition to dry delicate clothes, while a clothes hanger mounted to the wall is ideal for hanging freshly pressed shirts. 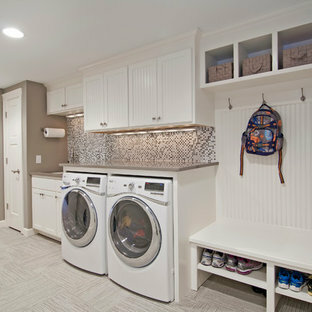 Multipurpose laundry rooms or utility rooms can help save valuable space in your home. Some would locate the water heater tank here. 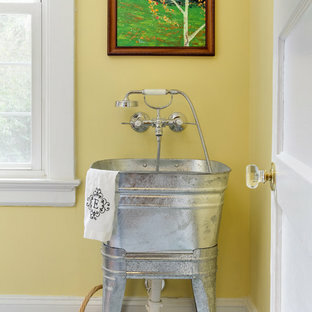 The laundry sink can be used to bathe your dog or cat; your laundry cabinet can store sports equipment, pails and umbrellas; and a spare nook can be filled with a desk and chair to create an office space while you wait for your load to finish. If your service yard is at the front of the house, consider using it as a drop station for mail, mobile phones and keys. Include a bench seat or stool, wall-mounted hooks for bags and a coat stand and it can even be used as a place to get the kids organised before you walk out the front door. 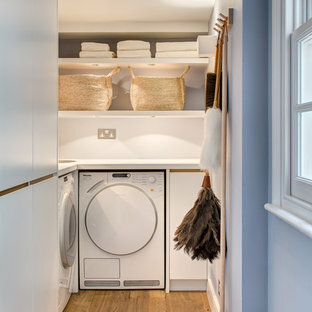 How can I decorate my utility room? 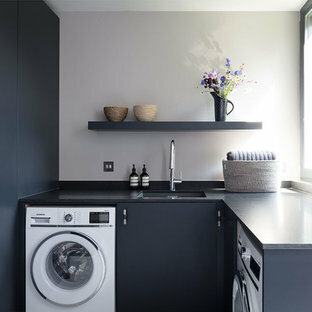 Service yards are usually filled to the brim with appliances and storage, so take advantage of your walls when decorating and use cheery paint colours or wallpaper to make doing the chores more pleasant! Fun signs, posters, murals and wall decals will also add character to the space. Think of your storage as decor, too – look for bins and baskets with decorative touches, and use brightly-coloured or patterned hangers. It would also be helpful to speak to a professional that can help you with decorating and doing the layout for the service yard. Roundhouse Urbo and Metro matt lacquer bespoke kitchen in Farrow & Ball Railings and horizontal grain Driftwood veneer with worktop in Nero Assoluto Linen Finish with honed edges. Photography by Nick Kane. By Doreen Schweitzer Interiors, Ltd.
Sage green beadboard with a ledge molding designed with a place for hooks to hang clothing is decorative as well as functional. Cabinetry is also Sage Green and the design includes space for folding and a sewing desk. The floor tile is ceramic in a terra cotta style.